It’s been a hectic last few months for India. They’ve been on the road for almost four months and they now return home for their final international assignment before the all-important World Cup 2019. After winning almost everything on their tours to Australia and New Zealand (only losing the T20I series in New Zealand), the ‘Men in Blue’ will look to extend their dominance at home as well. Australia, who played India just a month back, will start the tour with the two-match T20I series. The last time the two sides met in the shortest format, the three-match series ended in a 1-1 draw. 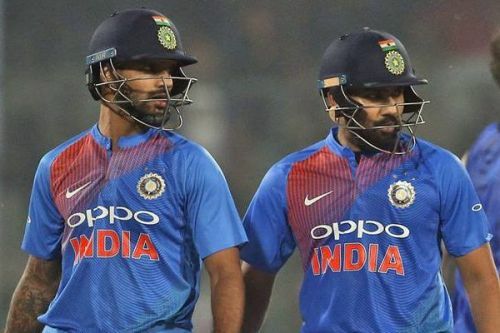 India have named a strong squad for the T20I series as they look to continue their recent dominance over the Aussies. As we build up to the first T20I, here’s a quick look at the probable playing XI for the Virat Kohli-led side. Rohit Sharma is currently the leading run-getter in T20Is; he has amassed 2326 runs, and has been excellent over the last few years in white-ball cricket. However, he blew hot and cold in New Zealand. Despite scoring a couple of fifties in the ODI series and another fifty in the T20I series, he looked scratchy. Hence, he will be looking to hit his straps once again. The Indian vice-captain also doesn’t really have a great T20I record against Australia (he averages 24.08), and will be looking to correct that as well. Shikhar Dhawan is going to partner Rohit Sharma once again at the top of the order. The duo have formed a fabulous opening partnership. Moreover, Dhawan was fantastic in the shortest format last year. He scored 690 runs which was the most by a batsman in a calendar year in T20Is. However, after a good start to the New Zealand tour, Dhawan couldn’t really get going as he registered scores of 29, 30 and 5 in the three T20Is. Hence, like his opening partner, the left-handed Delhi opener will also be looking to find some fluency.